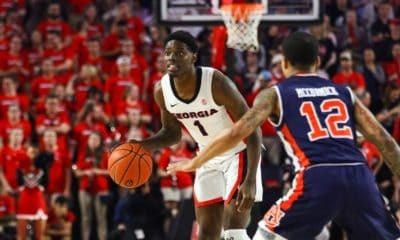 ATHENS, Ga. – The Georgia Bulldogs defeated Mercer 86-77 in triple overtime Saturday night at Stegeman Coliseum. It was the first-ever triple overtime game at Stegeman Coliseum in men’s basketball history. Georgia (7-3) had five players score in double figures for the second time this season. Charles Mann paced the Bulldogs with 22 points, adding six rebounds and five assists. Nemanja Djurisic and Marcus Thornton each scored 17 points, and Kenny Gaines added 13 of his own. J.J. Frazier finished the night with 10 points. Thornton and Gaines finished the night with 11 and 10 rebounds respectfully, making them the first Bulldog duo to record double-doubles in a game since Kentavious Caldwell-Pope and Donte’ Williams did so against Iona in December of the 2012-13 season. 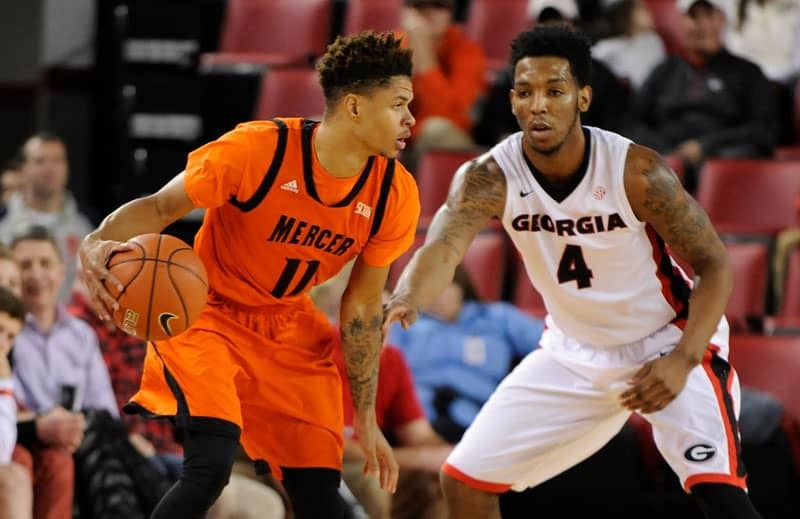 Mercer (6-7) saw over half of its points come off the bench, as non-starters totaled 48 points for the Bears to Georgia’s 15. The Bears’ bench outscored Georgia’s 39-1 after halftime. Two players for Mercer set career highs in scoring. Jordan Strawberry scored 21 points, including 14 in the second half and overtime, off the bench. Jestin Lewis scored all 16 of his career high in the second half and overtime. 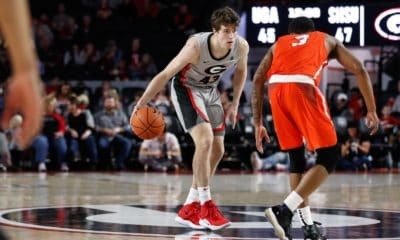 Georgia took a 32-23 lead into the locker room at halftime as both teams had trouble establishing any kind of offensive rhythm, each shooting under 40 percent from the field and just 25 percent from deep. Mercer failed to make a field goal from the 5:15 mark in the first half and until the 15:58 mark in the second half. After a Phillip Leonard layup ended Mercer’s drought, the Bears were able to close the gap steadily over the remainder of regulation as the Bulldogs continued to struggle from the field. The Bears finished regulation on a 10-3 run, including a buzzer-beater 3-pointer by Strawberry to tie the game at 51-51 and push the game into overtime. Mercer hit two three pointers early in the first overtime period, but Mann, Thornton and Djurisic each hit shots down the stretch to keep Georgia in the game. Strawberry again kept Mercer alive with a game-tying jumper with 1:32 left that proved to be the final point scored in the first overtime with the score tied at 62-62. The teams traded blows throughout the second overtime period until Lewis put Mercer on top 72-69 with under a minute remaining on his second 3-pointer of the period. After a Djurisic free throw cut the lead to one, Jelks committed an offensive foul that allowed Gaines to tie the game at 72-72 on a layup with just four seconds on the clock. Georgia took control in the third overtime period, connecting on three-of-five 3-pointers, all from three different players. The Bulldogs also outrebounded the Bears 6-to-3 in the final overtime period to preserve the 86-77 victory. 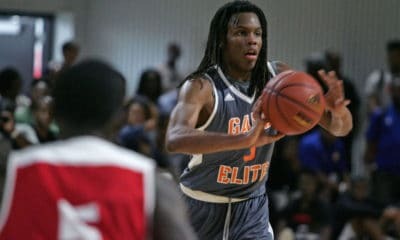 · Georgia’s starting lineup was: Marcus Thornton (70th career start), Nemanja Djurisic (34th), Juwan Parker (13th), Charles Mann (49th) and Kenny Gaines (40th). · This was the 79th meeting between the Bulldogs and the Bears. Georgia leads the overall series 55-23. · Georgia is now 6-0 on the season when playing at Stegeman Coliseum. 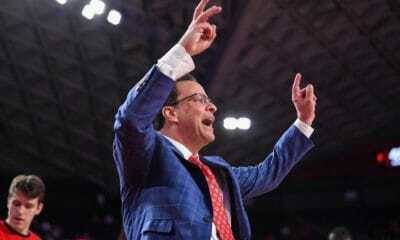 · This was the first-ever triple overtime game at Stegeman Coliseum in men’s basketball history. It was the first triple overtime game for Georgia since playing Georgia Tech at the Omni in Atlanta on December 19, 1990. · Georgia had a season-high 57 rebounds. · The Bulldogs connected on 13-23 shots in the overtime periods after shooting just 33% from the field in regulation. · Marcus Thornton (17 points, 11 rebounds) and Kenny Gaines (13 points, 10 rebounds) became the first Bulldog duo since the 2012-13 season to record double-doubles in the same game. · Thornton (44), Charles Mann (50) and Nemanja Djurisic (37) all registered career highs in minutes played. · Kenny Gaines recorded a career-high 10 rebounds. He also tied a career high with five assists. · Mercer’s Jordan Strawberry (21) and Jestin Lewis (16) each recorded career highs in points scored. Georgia will travel for their first road game since December 2 when they take on Kansas State on December 31. Tipoff is scheduled for 4:00 p.m. and the game will be aired on ESPNU. The Bulldogs will then return home for their first contest of 2015 when they host Norfolk State on January 3 at 2:00 p.m. at Stegeman Coliseum.